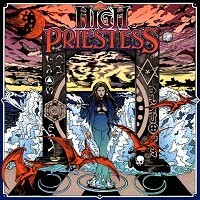 HIGH PRIESTESS is a heavy psych-doomy female power trio from Los Angeles. Formed in 2016,they released a demo in 2017 and now are proud members of the Ripple music roster. Their ascension is pretty fast and after a few minutes of listening i understand why: elaborated crescendos very inspired riffs ,Katie and Mariana are chemically connected and i feel it pretty much.The vocals are ranging from clean to harsh and harmonic. They sing along too, which is great. Female voices are a little more a rarity in this genre. It's mostly a man's world. So when i can hear female vocals and …even better a female trio, that's really getting my interest. It's heavy, fuzzed out Stoner with amazing Psych ambiance. The album starts very slow with a fade in invitation to this new experience. I'm thrilled. Pounding drums , guitars that are very an initiation to trance and oriental inspiration. And then guitars are praying instruments to a planified elevation or spirit travel. All is taking place slowly till Mariana's and Kaie's voices works their way out to propulse us to high levels. This song reminds me a lot of Al Cisneros, OM. Repeated riff that get through the mind while Megan's drumming is hitting the skins to assure the energy get his path to our brain. What a good song it is! Overwhelming ambiance, such a great starter. 10 minutes of hypnotic rock. "Despise" intro sounds like Iommi and a lot of Ritchie Blackmore, haunting for the first minutes, and then we have evil growls mixed up with melodic harmonic chants. The ambiance is nauseous and strange. This song act as a warning…that how i feel it. The ascension is a successful attempt to lead us to others levels, we are travelling from there to there, i don't mind i' letting me go. Nice progressions and writing. "Banshee" is an invitation to some sort of drug cult ceremony.Nice sound effects and recording manipulations . "Take the blame" is riff oriented and sound a lot the 70's. Man they could have toured with SABBATH in these times. FUZZY LAND. Basic and effective playin'. I'll take the blame anytime girls hehehe. "Mother forgive me " is like an incantation to some mother for another time.Very intriguing vocals. Nice teaming of Mariana and Katie. Some darkness lies in this song. Headbang approved. Superb energy many variations in tempo and directions. It never gets dull. The vocals are like ancient eastern female djinns singing to seduce us but in a tragic way! Finally , "Earth Dive" closes it all with a very cinematic approach. I really like that song,really. Song transpires sincerity and truth. She wants to show us another world , the other side,well i'd like to! The guitar is never too much simple but powerful. Emotionally driven, like its supposed to be. Organs makes some apparitions which is very cool, and all that beautiful dream or nightmare ( call it what you want ) ends here. Lettin us all alone wanting for more. For fans of : BLACK SABBATH, ACID KING, EARTHLESS , OM.